Conferences are meant to be instructive to some extent. Yes, they are certainly the place to discuss, hear and share ideas and concepts. But we also go to them to learn things. To discover new things or things we hadn't come across before. So, yes they are instructive. And that's certainly the experience we had when we saw Jacob Rees-Mogg give a master class in how to deal with hecklers at the Conservative conference in Manchester this week. Exemplary. Jacob Rees-Mogg appeared to have set himself the personal goal of speaking at nine separate conference events during a 48-hour period. That's some task for any speaker. But it also confirms that most of the action at the Manchester conference has taken place at fringe meetings, not in the main hall. The MP for North East Somerset was due to speak at a Bruges Group meeting in Manchester's historic Great Hall. But the meeting had barely started before protesters stood up and started to chant. No, it wasn't the sophisticated, clever heckle that you might receive at the Comedy Club. This was a chant, at best. And Jacob Rees-Mogg's response? He set a clear direction immediately. The voice of civilisation, albeit 18th century civilisation. But when his calming words appeared to have little or no effect on the hecklers Mr Rees-Mogg took matters into his own hands. So he walked into the audience and spoke with one of the protesters. Hello, what would you like to ask me? Now we have to say that the heckler appeared confused. Perhaps he wondered why on earth the "despicable" Mr Rees-Mogg wanted to speak with him of all people. But he did. In fact there was no stopping him. Don't just respond to the heckler, in kind. 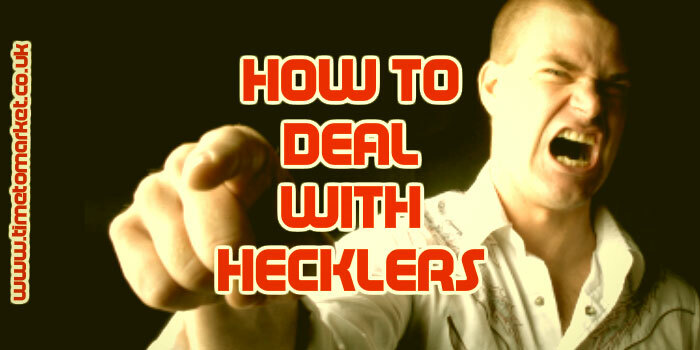 Ask the heckler an open question. Be engaging and supportive to retain your audience on your side. Watch the heckler's bravado slip away. Thank them for their time and say goodbye. Well, we may disagree on things, but just because you disagree with somebody, that doesn’t make them a bad person. The two are separate. So this approach worked. Because the confusion and energy of the heckler just drained away. He was worn down with the sheer politeness, sincerity and manners of "despicable" Mr Rees-Mogg. The protester looked for support behind him. But his colleagues had disappeared, no doubt bundled away. You sensed that his bravery for the cause was dissipating rapidly. And, indeed it was. So Jacob Rees-Mogg brought things to a close. Well, very nice to have met you. So, after a relatively brief yet meaningful exchange, Jacob Rees-Mogg ended the conversation, on his terms. And the protester was bundled away from the Great Hall. The security detail was, no doubt, embarrassed by the incident. But as a master class in how to deal with a heckler, this was masterful work from Mr Rees-Mogg. You can always discover more tips for public speakers with our range of tips, podcasts and videos. 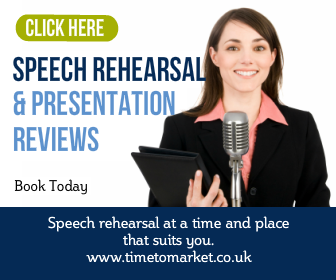 Or, when you feel the need for more intensive learning about public speaking, why not consider a coaching session. 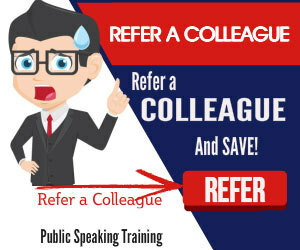 Because a full-day public speaking coaching session is probably the best route to you getting the confidence and skills to handle any situation. You might even have to face hecklers one day! Please don't hesitate to call.